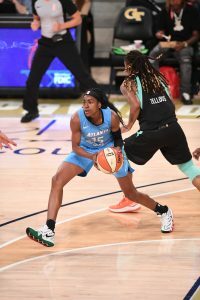 ATLANTA – Atlanta Dream guard Tiffany Hayes has signed a multi-year contract extension with the franchise, Head Coach Nicki Collen announced Tuesday. Terms to the agreement were not disclosed per team policy. Hayes, who was a second round draft pick in the 2012 WNBA Draft by Atlanta, is in the midst of her best season as a pro. She is averaging 17.7 points, 3.4 rebounds and 2.6 assists, while shooting a career-high 47.0% from the field. Earlier this week, Hayes was named the Eastern Conference Player of the Week for the third time this season and in her career and named the AP Player of the Week for the first time. . She has led the Dream to an 18-10 record and has her team sitting in second place overall in the WNBA standings this season. Hayes has career averages of 13.4 points, 3.3 rebounds and 2.3 assists over her six-plus years in a Dream uniform. She is the only second round draft pick to ever be named a WNBA Player of the Month, which she has done twice. Hayes was named a 2017 WNBA All-Starter and was selected to the 2017-20 USA Basketball National Pool Team. She was also a 2012 WNBA All-Rookie Team member. Earlier this season, the Dream signed center Elizabeth Williams to a multi-year extension and added free agents Renee Montgomery and Jessica Breland with multi-year deals. Atlanta also brought back Angel McCoughtry in the offseason. 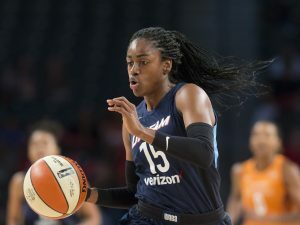 The Atlanta Dream will host the Las Vegas Aces tonight inside McCamish Pavilion at 7 p.m. ET. season, group tickets and single game tickets are available now. For more information, visit atlantadream.net or call 877.977.7729.